In a recent SIAM Review article, Diaconis, Holmes, and Montgomery have shown that under general conditions, a coin is inherently biased to land heads-up if it leaves the hand heads-up. This effect does not diminish as the coin is thrown higher or with more vigorous rotation and is not due to any asymmetry in the minted coin. This bias arises because the coin precesses as it tumbles, and is a straightforward, though novel, application of results due to Euler in about 1750. 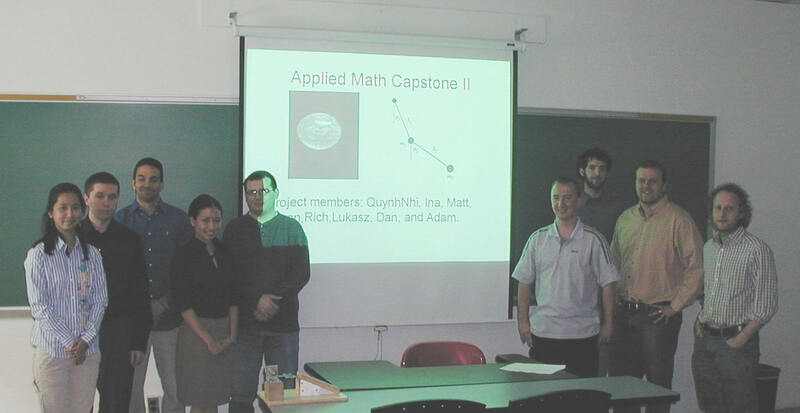 This result formed the culminating experiment of a capstone course in applied mathematics at NJIT. The first few weeks of the course were spent teaching the relevant results from classical mechanics. Several experiments were conducted using Capstone Laboratory equipment, ordinary digital cameras, and software from the Matlab Image Processing toolbox. Experiment 1: Calculating the gravitational acceleration constant g from a movie of a bouncing ball. Capstone Group Spring 2005: (From left to right) Ankit Shah, Alex Minicozzi, Gerardo Giordano, Prof. Roy Goodman, Kelly Winters, Laura Medwick, Bryan Shaw, Varun Oberoi. Graphics are from a gyroscope simulation with friction.